A government agency doesn’t think your family is worth protecting from BPA in cash register receipts—that workers may be affected by it, but not consumers. Huh? Doesn’t the cashier put the receipt right into your hand? Tell them this is ridiculous with our new Action Alert! Last August, ANH-USA filed a Citizen Petition with the Consumer Product Safety Commission (CPSC) to have the endocrine-disrupting chemical bisphenol-A (BPA) banned from thermal cash register receipts. 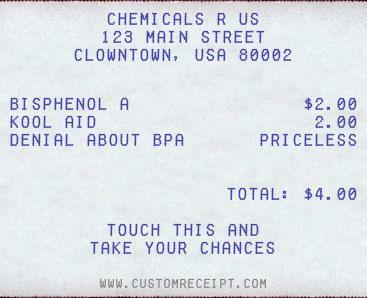 Cash register receipts are the little-known but most common pathway for BPA into your body. The CPSC responded by refusing to consider our petition, claiming that it did not meet their requirements based on some very flimsy reasoning: that the regulation of cash register receipts should be under the jurisdiction of worker safety (OSHA) and not consumer safety. In early March we once again sent CPSC our petition, accompanied by a letter demanding that the agency fully consider our petition and assess it on the legal grounds and evidence that we presented to them. Their reasoning seemed especially absurd since both workers and consumers handle receipts. Anyone who handles the receipts is at risk, including consumers—so it’s not just OSHA’s territory. CPSC has still not responded to our petition. Meanwhile, the Connecticut legislature has introduced its own bill to ban BPA on thermal cash register receipts and require the Chemical Innovations Institute to develop an annual list of chemicals of high toxic concern. Consumers are speaking out against BPA, and company shareholders are noticing. Twenty-six percent of Coca-Cola’s shareholders called for the company to publish a report to address consumer concerns about BPA in the epoxy linings of their cans. However, at Coke’s annual general meeting Wednesday, the CEO told shareholders that there was not enough evidence to stop using BPA in their cans. “If we had any sliver of doubt about the safety of our packaging, we would not continue to use (BPA),” he said. He used this phrase—“not a sliver of doubt”—despite the worldwide outcry against BPA , the government of Canada declaring BPA a toxic substance, and various bans in Europe. Please contact the Consumer Product Safety Commission and ask them to reconsider our petition, and to stop giving us the runaround.